In collaboration with Thai company Agriculture of Basin Company Limited (“ABC”), OSAKA GAS CO.,LTD. (“OSAKA GAS”) (TOKYO: 9532) launched a pilot project in Thailand on November 27, 2017 to ascertain the feasibility of supplying natural gas to vehicles by continuously removing carbon dioxide and other impurities from biogas generated mainly from agricultural waste, and refining it into high purity methane gas, thus realizing a future commercial operation. In this pilot project*1, at its palm oil factory ABC will digest organic matter contained in factory wastewater to generate biogas, which will be subsequently refined by OSAKA GAS into methane gas. ABC will use*2 the refined methane gas as fuel in its own natural gas powered vehicles. The pilot project is scheduled to run for roughly one year, during which time OSAKA GAS will test operate a 250 Nm3/h biogas refining facility that assumes commercial deployment. The project will focus on a verification of a long-time based stable operation and methods to minimize the cost of producing methane gas, as well as determine the effectiveness of the methane produced as a vehicle fuel. Based on the outcome of pilot testing, ABC will actively continue developing initiatives to effectively utilize the biogas generated at the factory as a fuel for natural gas-powered vehicles. OSAKA GAS has been engaged in developing biogas refining technology since 2012 in a pursuit to effectively utilize unused biogas, promote energy preservation, and help protect the environment. The company is capable of producing high purity methane gas with the world’s highest efficiency in methane recovery at a rate of over 99%*3. It has achieved this through its proprietary hybrid biogas refining system*4 which combines a CO2 separation membrane with PSA (Pressure Swing Adsorption), a technology that selectively adsorbs and removes CO2. Since agriculture is one of Thailand’s most prominent industries, as a consequence there is an abundance of biomass resources. These include palm residue, the remnants of sugarcane crushed to extract juice, and food factory wastewater. Natural gas vehicles are also becoming increasingly prevalent in Thailand. OSAKA GAS decided to carry out this pilot project in Thailand based on its confidence in the potential towards the reduction of greenhouse gas emissions by using its unique hybrid biogas refining system to effectively utilize biomass resources. Under its long-term business vision, “Going Forward Beyond Borders 2030,” OSAKA GAS has set a goal to expand its overseas energy business, and OSAKA GAS (THAILAND) CO., LTD. has already begun aggressively rolling out energy service initiatives and cogeneration systems. 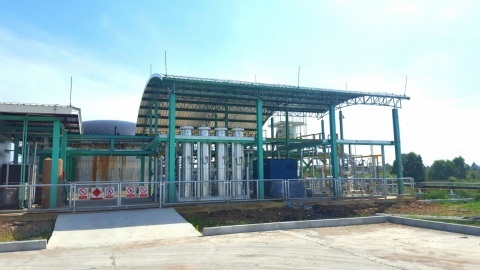 Looking ahead to the commercialization of biogas refining technology within 2018, OSAKA GAS is dedicated to advancing the reduction of greenhouse gas emissions by implementing this pilot project, expanding energy initiatives around Southeast Asia, and making effective use of biomass resources. *1: OSAKA GAS (THAILAND) CO., LTD., a local subsidiary of OSAKA GAS, is responsible for the construction of the pilot testing facilities. The company also plans to provide necessary assistance during the pilot testing period. *4: A system that combines PSA, which extracts methane gas from biogas using an adsorbent that selectively adsorbs CO2, together with a separation membrane that recovers methane gas by filtering CO2 from the off-gas discharged from the PSA. Using PSA to refine high purity methane gas while simultaneously recycling off-gas, has resulted in achieving a methane recovery efficiency of 99% or better―the highest level in the world. (1) Overview: ABC is a Thai company engaged in the manufacture and sale of palm products. ABC is actively pursuing the effective use of energy derived from its factory wastewater through initiatives such as selling biogas-generated electric power to local power companies. Overview of OSAKA GAS (THAILAND) CO., LTD.
(1) Overview: OSAKA GAS (THAILAND) is an OSAKA GAS group company engaged in developing energy services in Thailand’s industrial market. The company is also involved in ESP (Energy Service Provider) business activities, where it proposes solutions related to natural gas fuel conversions, energy saving systems to wastewater treatment and chemical agents.